Khalifa Stadium in Doha, thanks to REDI swivel quick to install and balance movement adjustment. Doha, enlargement of Khalifa Stadium: the construction of the new roof with an innovative design is about to end. The “Swivel Joint” by REDI have been chosen in rainwater drainage, discover why…. The new Doha stadium roof, is a state-of-art architectural structure, characterized by mobile parts: the sinuous lines, form two symmetrical parts in turn subdivided in into three “shells”, enabling the opening and closure according to the necessities. The opening and closure movement of the roof generates “relative movements” between the structural parts. The rainwater drainage, from the roof to the underground drainage, must bear these movements. 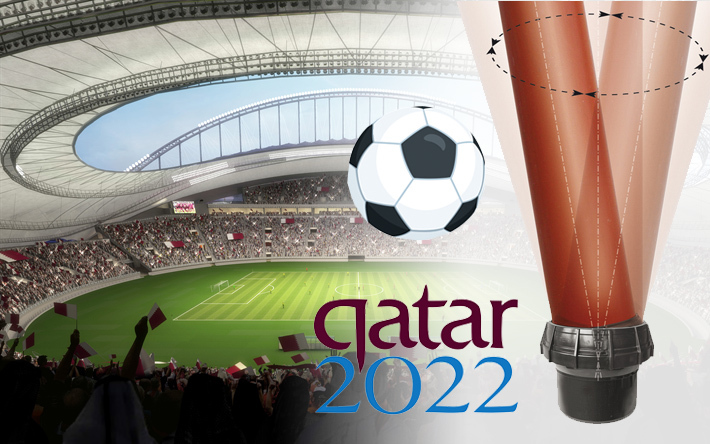 The Aspire Zone design Studio, chose the REDI swivel for compensating the movements between the horizontal and vertical pipes of the downspouts, generating a rigid and flexible system at the same time. The REDI Swivel Joint is made in PVC, it is composed by a socket and a joint obtained by the coupling of two hemispheres, the pipe can directly be connected by push-fit socket, or glued.Thanks to the spherical joint, the pipe has a 360° rotation freedom with a variation in range of +/- 10°. The values in cm are shown in the table below. For an application on a pipe length 4 meter, it let approximately +/- 70 cm of adjustment. By installing two Swivel Joints between the vertical descendant and the horizontal rain collector, the network becomes a dynamic structure, in balance with the whole coverage. We are proud to contribute to the building of this important architectural masterpiece, dedicated to the World Cup in 2022.